Two people were killed and at least 100 injured after a magnitude-6.7 earthquake rocked popular Greek and Turkish tourist destinations on the Aegean Sea early Friday, the U.S. Geological Survey and officials said. The earthquake sent tourists and locals running into the streets on the Greek island of Kos and the Turkish port city of Bodrum shortly after 1.30 a.m. (6.30 p.m. Thursday ET), according to the Associated Press. Both destinations are popular with European vacationers during the summer high-season. Turkey's most popular and widespread simit chain, Simit Sarayı, which turned simit into a brand in the country and opened to the world with franchises, has partnered with a Saudi firm. Having conducted partnership talks with foreign funds in recent years, Simit Sarayı has signed an agreement with Saudi Arabia-based Fawaz Alhokair Group for the sale of a 10 percent stake in the company. According to a joint statement released by the two companies, Fawaz Alhokair Group Vice Chairman and retail leader Abdul Majeed Alhokair will be appointed as a board member of Simit Sarayı. How did it begin? 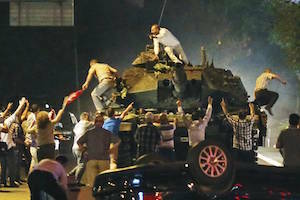 On July 15th, at about 10:00 pm, the coup attempt began with shots inside the General Staff complex in Ankara. Shortly after, the Presidential Complex in Ankara came under fire by tanks and helicopters. 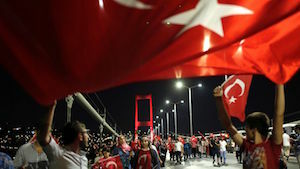 Meanwhile, it was reported that military forces had closed Istanbul's Bosphorus and Fatih Sultan Mehmet Bridges, and the Ataturk Airport was shut-down. Factions of the Turkish military took control of the state broadcasting agency TRT to officially announce the coup. 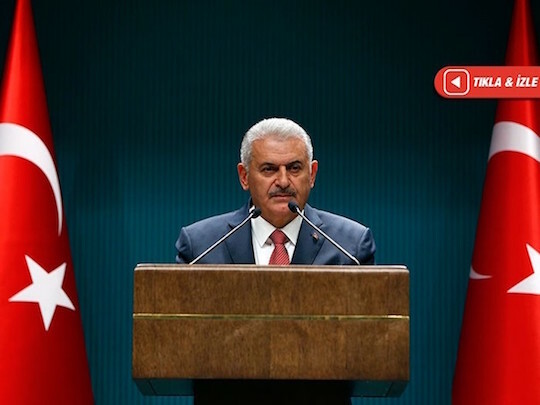 Prime Minister Binali Yildirim informed the nation that a coup attempt was underway. Addressing the nation via mobile telephone, President Erdogan confirmed the coup and urged people to resist and defend Turkey’s democracy by getting out to streets. Prime Minister Yildirim: "Our Nation Has Prevented The Suspension of Democracy And National Will? Prime Minister Binali Yıldırım, after the coup attempt of the separatist terrorist organization of Fetullah Gülen (FETÖ) held a press conference with Chief of General Staff General Hulusi Akar, Interior Minister Efkan Ala, Minister of Defence Fikri Işık and Minister of Justice Bekir Bozdağ and answered the questions of the press. Yıldırım stated that the 15th of July is a “Black spot in Turkish democracy”, "The name of the noble nation, who was on democracy guard last night during the coup attempt against parallel terrorist gang but returned to normal life in the morning, is the Turkish nation. I applaud all the members of my nation, all my citizens who stood against this parallel terrorist gang and took to the squares with their flags." he continued. Prime Minister Yildirim: Our Nation Has Prevented The Suspension of Democracy And National Will? (CBS) ? The attempted military coup in Turkey has stunned members of Chicago?s Turkish-American community. 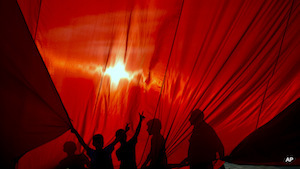 Many are worried about family members in Turkey, currently in the middle of the unrest. CBS 2?s Dana Kozlov reports. You?ll hear the same thing over and over from former and current Turkish residents: No one expected this. They waited Friday, nervously, to see how it would play out.